Everything you need to start 3D gaming, but is it worth the money? The entry into 3D gaming can be very expensive, and if your system is lagging behind the times, you'll probably need to start from scratch. Not only do you need a powerful PC, but also a monitor capable of 120Hz and an Nvidia 3D Vision kit, meaning a four-figure outlay is more than likely. That's where the Chillblast Fusion Impact comes in. 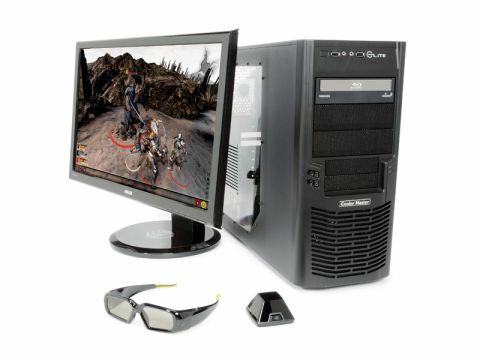 With the Impact, Chillblast offers a complete 3D system, with an GeForce GTX 560 Ti, a 3D capable Asus 3D monitor, the VG236HE and the full Nvidia 3D Vision kit for £1,200. The system comes set up for you, and Chillblast should also be applauded for the seamless integration of the system. It is shipped completely free of crapware, with 3D Vision installed and ready to go. It's easy to be dismissive of bundled desktop systems and the quality of their peripherals, but Chillblast hasn't cut any corners. The Asus VG236HE is still one of the best 120Hz monitors on the market, and will set you back around £400 with 3D Vision included. When you subtract the retail cost of the Asus monitor, the cost of the rig itself is £800. This places it very much in the mid-range bracket. Inevitably that means some sacrifices have had to be made. One sacrifice comes in the shape of the Intel Core i5 2500K chip, which Chillblast has opted to include over the i7. That said the new Sandy Bridge Core i5 processor is a monster, and is more than capable of handling most games at top quality. Chillblast has overclocked it from to 3.3GHz to 4GHz, eking out substantially more power. While this overclocked Core i5 chip packs enough punch to deliver top 3D gaming, it falls short of the raw power offered by the i7. This is demonstrated through its benchmark scores in comparison to the excellent Scan 3XS Vengeance. The Fusion Impact falls well behind the Vengeance in terms DX10 gaming performance and achieves significantly lower Cinebench rendering test of multi-threaded CPU performance. Comparing the two systems though may seem a little unfair. The Vengeance costs in excess of £1,500 without any of the bundled extras, so it's a significantly superior system, but raises an interesting conundrum. Do you actually want a 3D setup and is it really worth sacrificing the gaming speed a superior CPU/GPU combo would give you? Despite this lack of raw power, the Fusion Impact still offers a fantastic 3D experience, and this is thanks to the quality components chosen in the rig. Chillblast has opted for the excellent GTX 560 Ti, a great mid-range card, and a 1TB hard drive, which provides enough poke for seamless gaming. Our only issue is the LE version of Asus' P8P67 motherboard. Opting for either Pro version would give you SLI options and a great upgrade path for your GPU. The final decision though must come down to how highly you rate pure processing power, but the Chillblast Fusion Impact offers fantastic quality and value, and doesn't hold back on top performance.